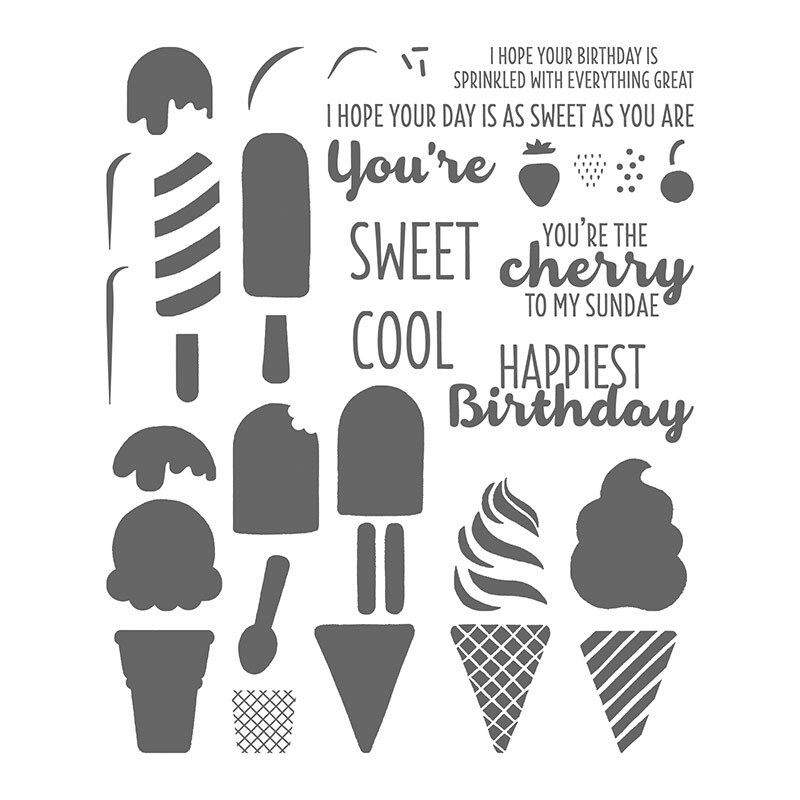 The Cool Treats stamp set has all sorts of fun pieces to make ice cream cones and sundaes and popsicles. And it also has various accessories, one stick (like I have on this card), double sticks, various cones, a strawberry, a cherry, sprinkles and little highlight pieces. And it includes a variety of sayings too. See all the parts in the picture below. On this card, I cut out the oval with the Stitched Shapes Framelits on the Big Shot. 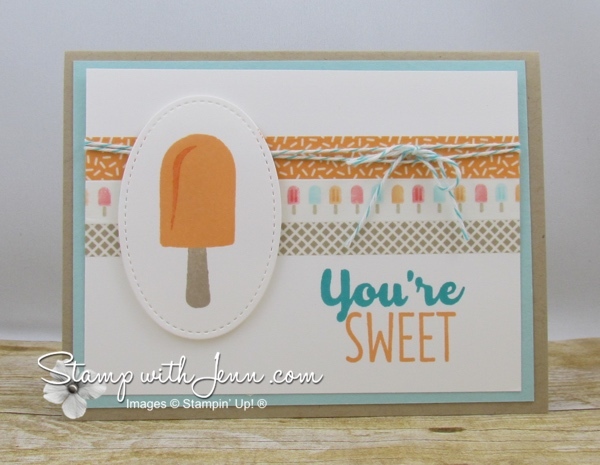 I stamped the popsicle with Peekaboo Peach ink. I love how this looks like a Creamsicle! For the highlight piece, I stamped it with Calypso Coral ink, but I first I stamped on my scrap paper to make the highlight a lighter version of the colour. For the popsicle stick, I stamped it with Crumb Cake ink. It is super easy to line up as the stamp set is photopolymer. What makes this card quick and easy to make is that the background was made just by wrapping Washi Tape around the white piece of cardstock. And how cute is this Washi Tape? 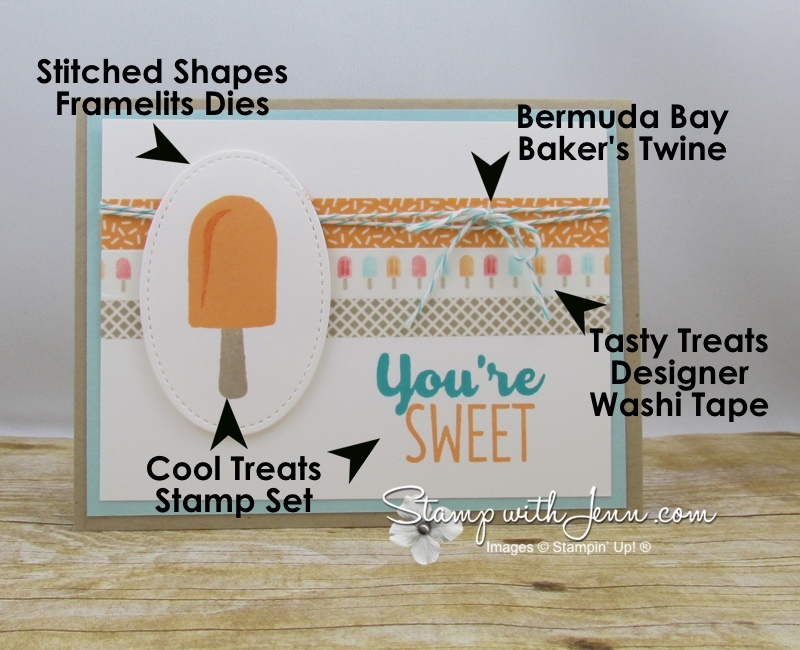 It is the Tasty Treats Designer Washi Tape and it matches the popsicles in the stamp set. I added just a little bit of Bermuda Bay Baker’s Twine wrapped around the card to match the stamped Bermuda Bay words on the cards. Check back to www.stampwithjenn.com later this week for more cards made with the Cool Treats stamp set.